So’s friend & teammate at Webster University (2013 & 2014 U.S. National College Team Chess Champion) GM Ray Robson whom he defeated 1.5-0.5 in the finals settled for the 2nd place worth 50,000 USD. Stage 1 (9-12 Oct). Qualifying round (R1 ro R7) to determine the Final-4 who plays the finals on Millionaire Monday. When necessary tie-break playoffs will determine the top four players for Semi-Finals & Finals. For the players who fail to make the cut, the competition will play out for two more rounds (R8 & R9) on 13 Oct to complete the nine rounds and chances for norms as well as in determining the standings and prize distribution. Stage 2 (13 Oct): Semi-Finals. The top seed of the Final-4 plays the 4th seed while the 2nd seed plays the 3rd seed in a knockout play using the MCO Play-off Format. 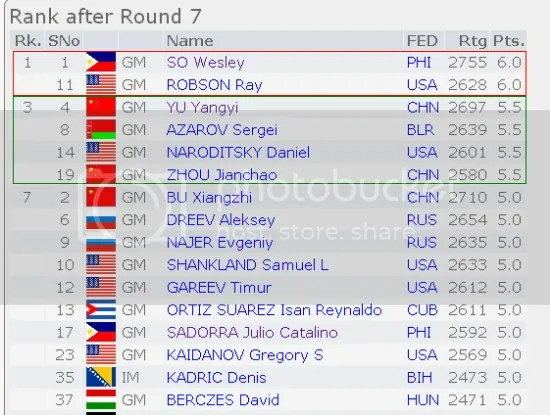 After seven Swiss-rounds, GMs Wesley So and Ray Robson were tied at 6.0/7 points apiece with Wesley So getting the upperhand & the semi-finals #1 seed due to his higher tiebreak points. GM Robson got the #2. 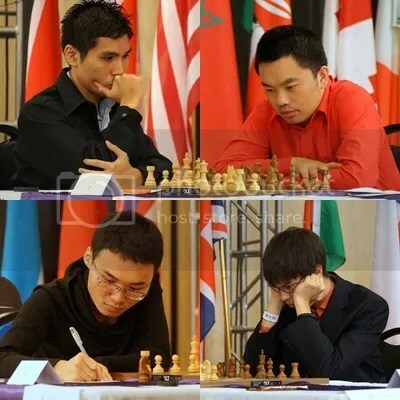 With GMs Yu Yangyi, Azarov Sergie, Naroditsky Daniel & Zhou Jianchao tying at 3rd place scoring 5.5/7 points each, the 4-players had to play a round-robin playoff that ended with the 2 Chinese players GMs Yu (#3) & Zhou (#4) prevailing and completing the Final Four. Wesley So vs Zhou Jianchao & Ray Robson vs Yu Yangyi. It’s Webster University vs China. The first to qualify in the Finals was Ray Robson when he defeated double Olympiad Gold medalist Yu Yangyi (Team Gold + Brd-3 Gold) in two games 1.5-0.5 to reach the Millionaire Chess final. Next finalist was Wesley So when he defeated Zhou Jianchao 2-1 in three games. An all Webster University Final. 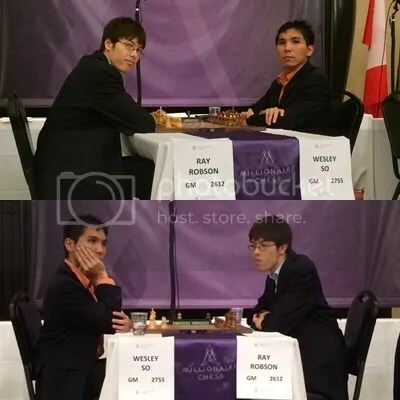 Wesley So Vs Ray Robson won by Wesley So in two games 1.5-0.5. 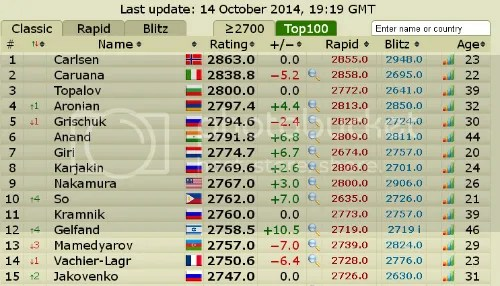 GM Wesley So now ranks #10 in the World. For the record Wesley So performance in Las Vegas was 5Wins-2Draws-NoLoss in the 7-rounds of standard chess and registered a Tournament Performance Rating (TPR) of 2849. He gained a +7.0 points to bring his FIDE ‘Standard’ Live rating to his all time high of 2762 that ranks #10 in the World’s Live Rating list as of 14 October 2014. Come November 2014 FIDE rating publication this will break his current official peak rating of 2755 established since August 2014. 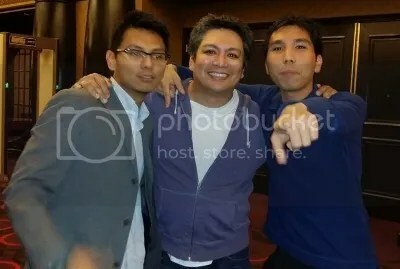 Philippines #2 rated player GM Sadorra, Catalino Julio scored 6.0/9 points placing 11th-22nd overall and shared a prize of $1834. GM BArcenilla, Rogelio scored 5.0/9 and placed 35th-50th overall with a shared prize of $800. 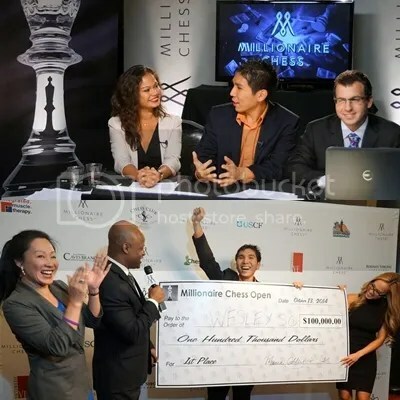 The next Tournaments slated for GM Wesley So will be the 2014 SPICE Cup Open Sponsored by Webster University and the Susan Polgar Foundation at St. Louis, Missouri on October 21-26, 2014. On 27-30 December 2014 will be the 2014 Pan American Intercollegiate Team Chess Championship at Brownsville, Texas.